Filtering in the wilds of North America and the Third World. "Water filters are one of the most popular items for backpackers and hikers all over the world..."
Many have come on the market in recent years. Water filters are still the preferred method of getting rid of water on the hiking trails of much of the world. 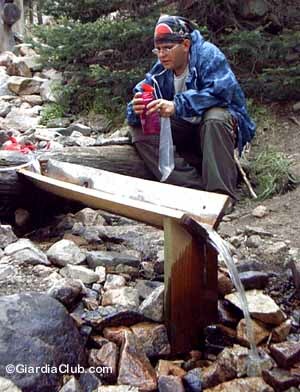 In the United States, water filters are used in all wilderness areas. They have the advantage of "no taste." Water that has gone through a water filter usually does not have a taste. Or if the filter has some iodine on it to kill viruses, the taste is minor. The other main advantage is that they produce purified water relatively quickly. Once you run the water through the filter you can drink it immediately. You don't have to wait 30 or 60 minutes, as you do with chemically treated water. And of course, it's much easier and quicker than boiling water." Perhaps the main thing water filters have going for them is tradition. Most backpackers and hikers are accustomed to using them. And neophytes generally turn to them first. As we have mentioned elsewhere in this web site, water filters are not without their problems - expense, clogged filters, bulk and weight in the back, and generally being rather a pain to use when pumping water. That's why we usually recommend chemical treatment. But many backpackers still prefer using filters. So, we have come up with our recommendations on the top filters for the money - the water filters that give the best value for the money. In recent years there have become more filtration equipment available, including some that aren't as expensive as in the past. It's some of those water filters that we are looking at. One on the forefront is Pure water filters. Giardia and water filters in the real world of hiking and backpacking. Giardia - the Horror Show.